Govardhan Puja is celebrated a day after Diwali. This auspicious day is an initiative of Lord Krishna in which a small hillock called Govardhan is worshipped. This year, this legendary day falls on October 20th. To be precise, this day is celebrated on the Pratipada Tithi in the month of Kartik. On most occasions, this Puja coincides with the Gujarati New Year. How is Govardhan Puja day celebrated? This day also acknowledges the victory of Lord Vishnu in the dwarf form of Vamana over the demon King Bali. Thus, on this day many special poojas are initiated in most Vishnu temples. On this day, these temples are also beautifully decorated which is a sight to behold! 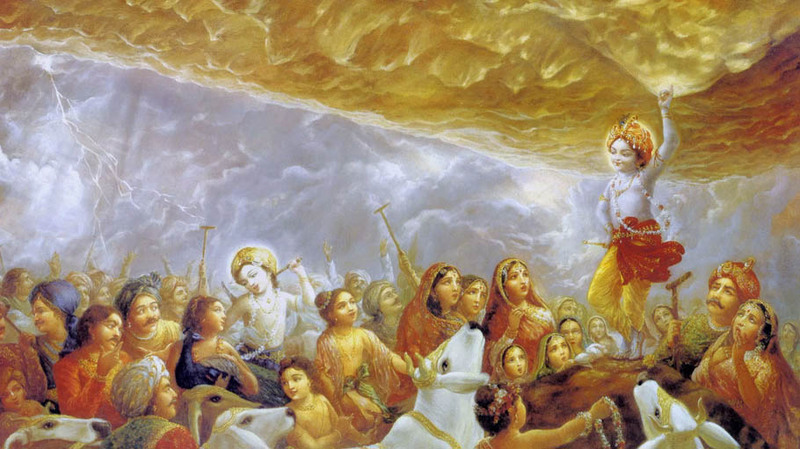 On this very day, Lord Krishna lifted the Govardhan rock on His little finger and protected the Brajwasis from heavy rainfall. Since the cow holds a significant place in Hindu traditions and is also a favorite of Lord Krishna, people also do a Gou-Pooja on this day. Cows are worshipped and fed with sumptuous meals. Another interesting ritual that is observed on this day is the Annakoot Utsav. Annakoot literally means ‘a mountain of food.’ On this day, such mountains of delicious dishes are offered to Lord Krishna. Generally, 56 or 108 different kinds of delicacies are cooked in this Mahabhog and offered to Lord Krishna. In many Krishna temples, the idols of Radha and Krishna are given a milk bath, adorned with beautiful attires embedded with highly precious beads like diamonds, pearls, rubies, and sapphires. How do you perform Govardhan Puja at home? 1. In the morning, make a small model of the Govardhan Parvat at home using garden soil. 2. Decorate and adorn it in the same fashion like you would adorn Lord Krishna. 3. Place a crown (mukut), flute (bansuri), tilak and flowers on the Parvat giving it the shape and look of Lord Krishna. 4. Light a lamp and offer roli and grains of rice. 5. Offer 2 sticks of sugarcane, a bowl of curd, unboiled milk, and sweets. 6. Lastly, perform a parikrama around the Parvat. 7. Lastly, perform the Arti of the Govardhan Parvat. Why Do We Go To Temple and How Does It Help Us? Karthik Purnima (28.11.12)- The day of celebrations!